Located in Orlando, Universal's Loews Sapphire Falls Resort is within a 15-minute walk of Universal Studios Florida™ and Universal CityWalk™. This 4-star hotel is 1.1 mi (1.8 km) from Universal’s Islands of Adventure™ and 1.3 mi (2.2 km) from Universal’s Volcano Bay™. Make yourself at home in one of the 1000 air-conditioned rooms featuring refrigerators and iPod docking stations. Wired and wireless Internet access is complimentary, while 49-inch flat-screen televisions with cable programming provide entertainment. Private bathrooms with shower/tub combinations feature designer toiletries and hair dryers. Conveniences include phones, as well as laptop-compatible safes and desks. Enjoy a range of recreational amenities, including an outdoor pool, a waterslide, and a spa tub. Additional features at this hotel include complimentary wireless Internet access, concierge services, and an arcade/game room. If you're planning a day at a nearby theme park, you can hop on the complimentary shuttle. Enjoy Caribbean cuisine at Amatista Cookhouse, one of the hotel's 2 restaurants, or stay in and take advantage of the 24-hour room service. Snacks are also available at the coffee shop/café. Relax with a refreshing drink at one of the 2 bars/lounges. Cooked-to-order breakfasts are available daily for a fee. Featured amenities include a business center, dry cleaning/laundry services, and a 24-hour front desk. Planning an event in Orlando? This hotel has facilities measuring 115,000 square feet (11 square meters), including a conference center. Self parking (subject to charges) is available onsite. 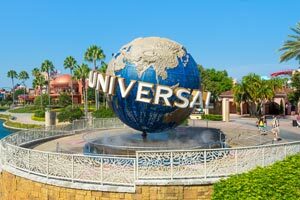 The preferred airport for Universal's Loews Sapphire Falls Resort is Orlando, FL (MCO-Orlando Intl. ).